A development site in Waitara on Sydney’s Upper North Shore has been sold on behalf of Meissen Properties IB Pty Ltd to a private Chinese developer for over $12 million as part of a structured transaction. According to JLL agents, the prices for Development Application-approved sites across Sydney, and particularly in outer suburbs, are on the increase as demand from local and overseas investors in the city’s property market continues. According to Sam Brewer, JLL’s Head of Metropolitan Sales and Investments for NSW, the prices currently being secured for DA-approved sites across Sydney are reflective of demand combined with a limited supply of these types of sites on the market. “Developers are willing to accept lower margins due to the reduced risk – DA-approved sites represent a confirmed development investment and can often save a lot of time on paperwork,” said Mr Brewer. “This Waitara transaction is further evidence of the values in and around the city, compared with those in suburbs further out, becoming more closely aligned. A year ago, most of the demand for development sites was for properties closer to the CBD. The market is increasingly considering properties further out. “We’re seeing a real closing of the gap in the variance of site values to locations. Prices have risen dramatically in areas like Waitara over the last 12 months. The key to growth areas seems to be transport – suburbs along a rail line or in close proximity to public transport are highly in demand. “It’s an evolving market and we’re now seeing the results of high levels of demand on limited site availability,” said Mr Brewer. 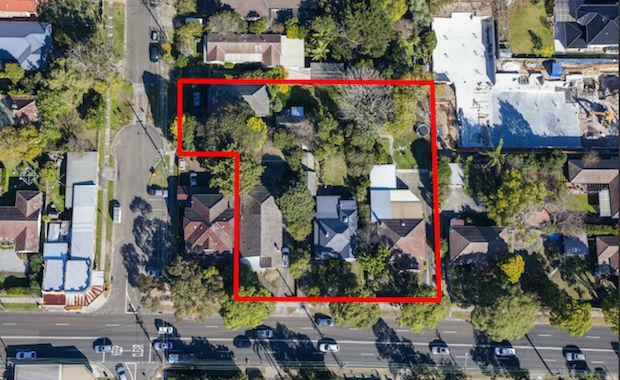 DA-approved for 81 apartments, the property at 55 Balmoral Street and 40 Edgeworth David Avenue, Waitara is currently made up of an amalgamation of four separate residential dwellings on four separate titles. The site consists of four older-style, small, three-bedroom homes with parking. The property features a large frontage to Edgeworth David Avenue, along with vehicle access from Balmoral Street.